Vietnam is eager to bolster its defence cooperation with the European Union (EU) and the bloc’s member states, Deputy Defence Minister Nguyen Chi Vinh said in a reception for outgoing Ambassador and Head of the EU Delegation to Vietnam Franz Jessen on August 6. The Senior Lieutenant General said bilateral cooperation in defence has yet to meet its full potential, calling upon the two sides to enhance collaboration in regional security forums and in joint security ventures, such as peacekeeping or post-war landmine and unexploded ordnance clearance. He expressed his belief that Franz Jessen will continue his efforts to boost Vietnam-EU relations in a result-oriented manner in his new post. Meanwhile, Jessen noted the recent progress in security and defence collaboration between the two sides. 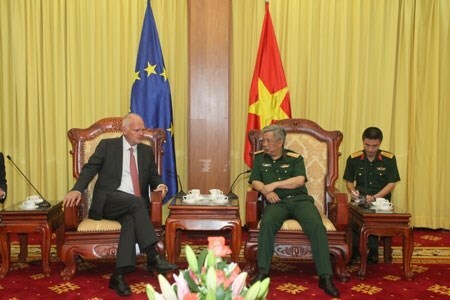 He said the EU is willing to support Vietnam in peacekeeping, piracy prevention and military personnel training.